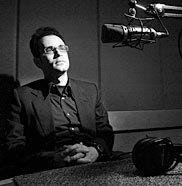 Many of Goldstein's pieces have been featured on the PRI radio show This American Life where he is a contributing editor. From 2000 to 2002 he was also a producer of the show. Currently, Goldstein hosts a show on CBC Radio One called WireTap, a program featuring stories told over the phone. He was also the host of the CBC summer radio program Road Dot Trip in 2000 and has contributed to shows like Dispatches and Outfront.